1 Painting is here to offer you a high quality services with affordable Pricing. Want to connect with Omid? # 1 Painting is here to offer you a high quality services with affordable Pricing. 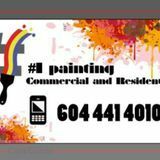 We are a professional team with lots of experience in painting, power washing and handy man in Vancouver Mainland. We offer residential and commercial painting and power wash with free estimation in any time and any where. It would be our pleasure to provide you with a brief information over the phone or by person. Please contact Omid Rahmani to 604-441-... by call or text for more information.